My toddler Charlie is my pride and joy and the inspiration for my quest to play on the PGA Tour. When he was 9 months old, I introduced him to golf with a set of plastic golf clubs. While sitting-up, my little guy started whacking plastic golf balls, demonstrating strong eye-hand coordination. Once he was on foot and walking, balls littered the master bedroom, which had become Charlie�s indoor range. Every morning before heading to preschool, he enjoyed hitting a bucket of balls from one end of the room to the other. Soon, he wanted to accompany me to the golf course, where we�ve developed a routine. Learning about etiquette and camaraderie, we first say hi to the pro in the golf shop. Then, we head to the driving range, where Charlie gets busy setting-up a practice station with his clubs, balls, and tees. He announces, �I�m going to use my boomer�� as he pulls the driver out of his bag. We alternate swings in order to slow down the rapid fire of his ammo. Next, we spend time at the chipping and putting greens. I can actually work on my short game as my junior golfer is happy to work his way around the holes, yelling out a loud �Yes!� whenever he sinks a putt of any distance. If we have time, we play a few holes. Charlie hits shots from the fairway and putts on the green. In the golf cart, he commands, �Dad, don’t drive too fast around the turn.� While I steer the wheel, he sits close and holds onto me for dear life. On my 40th birthday, I took Charlie to the golf course. Watching his joy as he ran across the fairway, my life-long love with golf flashed before my eyes. I wondered what I would say when he asks why I never tried to play the Tour. At that moment, I realized that I had to awaken my sleeping dream. I hope my quest to play on the PGA Tour will inspire Charlie to always pursue his dreams. Who has inspired you? Your father, mother, son, daughter, or another family member? Maybe a teacher or coach? Take a moment to leave a comment and share your story. Until next time, enjoy golf, America! Your story is outstanding – I can practically visualize it. I waited until later in life to have children (8, 5, and 11 months). They are my motivation, inspiration, pride and joy. Enjoy every moment. When my son was about 18-months old, I was home watching the US Open. He looked at the TV and said, “Golf!” That’s when I knew he was definitely my son. He loves practicing and at one time could name tons of guys on tour including David Toms and, his favorite at the time, Jay Haas. Took him to Doral where Padraig Harrington tossed him a ball as he walked off the 10th tee. Lately, he has gotten more into baseball, soccer, tae kwan do, etc. I’m looking forward to knocking it around with him one day. He’s so coordinated (he is 7 now) I am sure that his first real round he’s gonna pull a David Duval on me and card something in the mid-70s. Good luck, Phil. What you’re doing ain’t easy, but nothing worth doing ever is. Hope to see you out there one day soon. My kids are definitely my inspiration too. They are my muse. Great write up. I laughed at the quotes of your son. So amazing what a kid can enjoy, when they see how their father loves it. They love to imitate. Phil, thanks for a great story. My daughter Lola will turn 1 next week and I’ve been thinking about when I will introduce her to this crazy game. She is just this week walking for the first time so it won’t be long. I hope she will be as excited about being on the course with me as Charlie has been with you. Best of luck on your journey. Lola and I are rooting for you and watching for you. 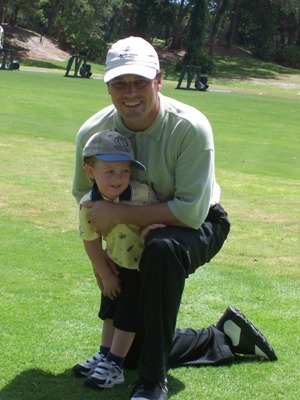 Phil, from a Third-Generation Golf Pro… with my son maybe doing it too, eventually. Just had the chance to read your article. Just awesome. I’m sitting here watching my little 9 month old daughter, and dreaming of that first swing of the club, and our first times at the golf course. Brings a tear to my eye now, and I’ll probably be a mess when that day arrives. The game has meant so much to me, and she means everything. The combination is beyond words. Hope the practice is going well. I have 3 kids: Ovi is 4 years old, Lucas is 3 years old, and Nicolas just 5 moths old. Both of my two big boys like golf. They have seen me everyday going to the golf club, so they really enjoy it, too. They’ve had their own US Kids golf bag since age 2 or 3, and you can not imagine how they can hit the ball!!! But the best thing about this is their happy face when they hit it… It’s unforgettable. All of the comments on the Charlie post are so special and from parents expressing their love for their children. Thanks so much for sharing your touching stories. Phil, I cannot wait to see you play on the Tour, and I know you will. Just remember to let me know when you play the Masters! As to who inspires me, my late sister Leslie. She died almost 5 years ago this February. She died very young at 14. I made a decision that in her honor I would live my life to the fullest. All the things that she never got to do, never got to see, never got to taste or touch… I’ll do it for her. I am on a personal quest to finish an Ironman in my lifetime. I can relate with BIG dreams. If you’re gonna dream, it may as well be BIG!!! My heartbeat and my son are one. My inspiration, I wish there was a bigger word to describe the way I feel about my son. All these things go through my head when I see him smile, when I see him laugh, when I see him cry. I truly know the meaning of unconditional love. I often wish that I can go back to his time and start all over and find that world he knows again, where everything is new and fun. You know what? Sometimes I find myself there. I think I have been inspired the most by his ability to remind me of the simple things that mean so much that we take for granted. I have had a very tough road like many. But that road seems to be all worth it. Without that hard road I would not appreciate his life and love. Knowing that if there was a choice between his well being and mine that there would be no hesitation or second thought of the outcome. My heartbeat and my son are one. He makes me love more. He helps me see. He is many times the reason why I look forward to the next morning. Like I said, I can�t think of a word big enough to describe his inspiration. I also want to point out my wife. Without her love I would not be.